Ukima Park (浮間公園) is located north of Tokyo Metro. 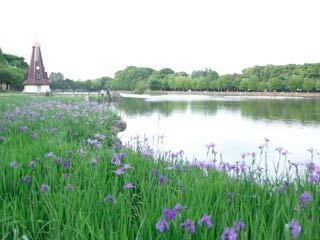 It has a big pond which you can enjoy fishing. There are many sports facilities, such as base ball field, tennis courts, and play ground. It was open in 1967 as the gift from mayer to children of Tokyo. You can enjoy Kakitsubata Flower in middle of May.